Load testing is used to verify that the battery can deliver its specified power when needed. The load is usually designed to be representative of the expected conditions in which the battery may be used. It may be a constant load at the C rate or pulsed loads at higher current rates or in the case of automotive batteries, the load may be designed to simulate a typical driving pattern. 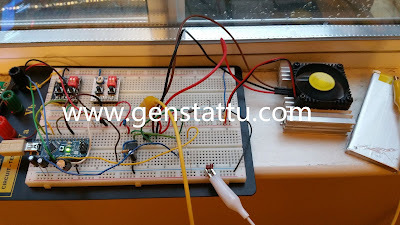 Low power testing is usually carried out with resistive loads. For very high power testing with variable loads other techniques may be required. A Ward-Leonard controller may be used to provide the variable load profile with the battery power being returned to the mains supply rather than being dissipated in a load. Note that the battery may appear to have a greater capacity when it is discharged intermittently than it may have when it is discharged continuously. This is because the battery is able to recover during the idle periods between heavy intermittent current drains. Thus testing a battery capacity with a continuous high current drain will not necessarily give results which represent the capacity achievable with the actual usage profile. Load testing is yet another way of testing a battery. Load test removes amps from a battery much like starting an engine would. A load tester can be purchased at most auto parts stores. Some battery companies label their battery with the amp load for testing. This number is usually 1/2 of the CCA rating. For instance, It is 4000mah 80C made 2011 weight 127 gr/cell full discharged 200 Amps. 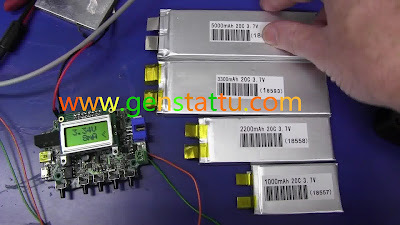 It is gens ace 5000mah 65C made 2012 weight 133 gr/cell full discharged 275 Amps. A load test can only be performed if the battery is near or at full charge. We decided the only way to get some answers was to put a few batteries under a serious high load and see what squeezes out. Regardless of what the manufacturers imply with their high C ratings, even a gold plated battery pushing 200 amps through 10 gauge wires will melt the solder off the junctions. 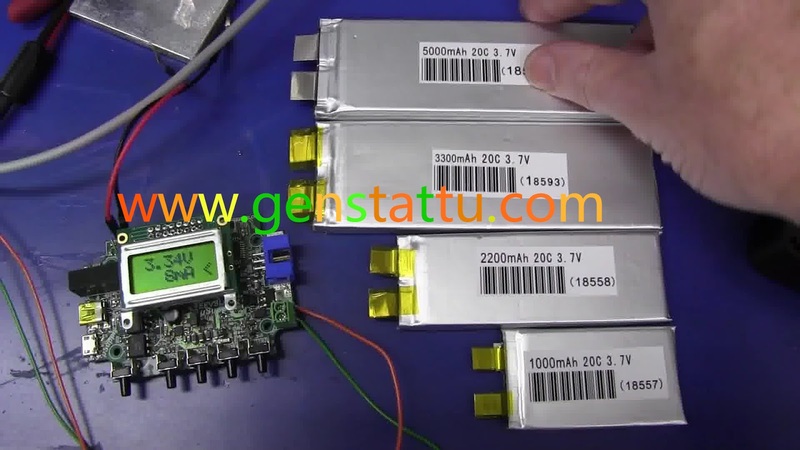 A case in point is the first test of Gens Ace 5000mah, 65C, lipo battery 4s showed that the 4mm bulleted split pack link connector melt off their wires at the equivalent of 32C. Higher charge rates will only improve performance if you run the pack as soon as it's off the charger as this will result in slightly higher cell temps which reduces the IR. You could charge a pack at 1C and then put under some lights or other heating source and get the same results as charging at higher rates depending on how hot your heat source is getting the pack. I have come to the conclusion that in a hardcase 2S pack the maximum C rate possible is 35 to 40C if the pack has 5000mAh. If the pack has 6500mAh it will have 25 to 30C. Voltage available under high load was another area of question. I've seen ESC's cut out when the throttle is opened past 75% because a crap battery couldn't keep up with a motors current demand so the ESC shuts down on low voltage. So what's a "respectable" percentage of voltage a battery will hold under load? Does one hold 5% voltage reserve at WOT conditions while another will hold 25%? To get a start at some answers I built a box that puts a constant resistance across the batteries terminals. Using OHM's law and 6S as my standard I calculated what the nominal current should be and provided a number of different "taps" or resistances I could plug into. The resisters are large spiral types that act like a powerful heater so 1200 SCFM of air is blown over them during testing. While the batteries are under load the voltage, current and temperature are recorded. A common lipo tester is plugged into the balance taps so the actual percentage of voltage remaining is displayed. There are the caveats: This is called "resistive" loading. When we run our motors we are putting them under an "inductive" load which is a different kind of load. A resistive load will tell you alot but there will be difference in the results. Also differences whether the load is pulsed or sustained, etc. Therefore the second half of this posting will be with an inductive load producing tester.